How to Sell a House with a Bad Roof? Selling a house with a bad roof can become a big challenge. There in no question that buyers will analyze your house carefully prior to making a decision. And of course, a bad roof has a huge negative impact on potential buyers and, therefore, on the asking price. 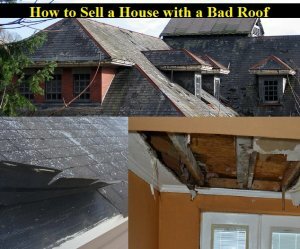 If you need to sell a house with a bad roof then you’ll have several options. You can either replace/repair or sell your house with an existing roof. Sometimes, people don’t have time and money to get a roof repaired or replaced. Finally, they choose to sell their house As-Is. Remember, it’s possible to sell a house with a bad roof. Keep in mind that you can sell a house in any condition. It’s crucial for you to set the right asking price for your property and follow an effective strategy that works. So, if you find it hard to sell your house with a bad roof then you shouldn’t fall into despair. We are here to help you with that! In this blog, we’ll explain to you what exactly you can do in this situation. Follow our tips to sell a house with a bad roof fast and easy! Should You Repair, Replace Your Roof or Sell a House with Existing Roof? Re-roof or sell with an existing roof? In fact, it’s one of the most common questions that people often ask when they need to sell a house with a bad roof. Obviously, they would like to know whether roof repair (or roof replacement) is worth it or not. Now, we’ll help you find the right answer to this important question. First of all, you need to contact roof experts for a consultation. After analyzing your roof, experts will advise you upon the appropriate solution. As a result, you’ll get an understanding of how much roof repair or roof replacement work costs. Another important thing that you need to do is to analyze your real estate market carefully. When studying the market you obviously need to pay a close attention to similar houses that don’t need roof repairs or roof replacements. This will help you figure out how much your house with a good roof costs. Lastly, you need to deduct roof repair/replacement costs from the price of your house with a good roof. So, you’ll be able to figure out if it makes sense for you to repair or replace a roof. It’s clear that your goal is to sell a house at the highest possible price. Sometimes, a roof requires small repairs. However, if you get your roof repaired you’ll be able to sell your house at much higher price. Roof replacement can also help increase the value of your home significantly. On the other hand, it can be too expensive for you to have a roof repaired (or replaced). In this case, it would be better for you to sell a house As-Is. Also, roof repairs (or roof replacements) require some time. That means that roof repair or roof replacement is not a good option for you if you need to sell your house fast. As it was mentioned above, selling a house with a bad roof can be too stressful. It’s worth noting that the vast majority of buyers are not interested in purchasing properties with a bad roof. Some people may be also interested in purchasing your property at too low price. Read on and we’ll provide you with tips for selling a house with a bad roof fast. Let’s assume that you don’t have enough money to have your roof repaired (or replaced) before selling. Or, maybe, you don’t like to spend too much time on roof repairs/replacements. One way or another, you’ll need to sell your house with an existing roof. The problem is that it may take you (or your real estate agent) a long time to find a buyer who would be interested in purchasing a house with roof problems. So, the best thing that you can do in this situation is to sell your house to real estate investors who agree to purchase properties in any condition. Many investors choose to purchase properties in so called “As-Is” condition. That’s something that people who are selling a house with roof problems really need. Real estate market is highly competitive these days. A quick Google search reveals that a lot of real estate investors operate on the market today. Most of investors provide their customers with fair cash offers. It’s clear that the more investors work on the market – the better! It is easy to guess that some of investors will probably offer you a higher price for your property to beat the competition. Another important thing that you need to be aware of is that the vast majority of real estate investors choose to buy properties in any condition. That means that you’ll find it easy to sell your house to an investor. Keep in mind that real estate investors act very fast. Traditionally, it takes an investor 24 – 72 hours to provide a seller with a cash offer. After analyzing numerous cash offers from real estate investors you’ll be able to choose the best one. As a result, you’ll be able to sell your house with a bad roof at the highest possible price. However, the most important thing is that people find it easy to deal with real estate investors. It’s important to know that real estate investors purchase houses and other types of properties with cash. When selling a house to an investor you don’t have to pay any fees. In addition, sellers not have to deal with any hassles and any obligations. You’ll be able to sell your house to a real estate investor within 7 days. Without a doubt, selling a house with a bad roof to a real estate investor has many great benefits! For a confidential cash offer on your home, contact us today by calling (210) 693-1533 or filling out the form on this page. What Should I Do if I’m Behind on My Mortgage? Can You Sell a House in Probate?